1993 foal. Owner bred by Cheveley Park Stud and trained for them by M. Prescott winning four races from 5f to 6f between 2yo to 3yo and a 3yo 6f Group 1 winner. At 2yo won one from two when unplaced on debut in 6f maiden on Oct 19th and then successful in a 6f maiden on Oct 30th. 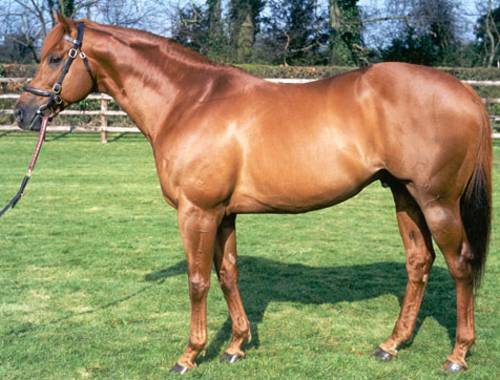 To stud in 1997 at Cheveley Park and his very good results have led to him having a very high (almost 'Midas Touch') reputation. Group 1 winners have included Chorist & Peeress (both owner bred by Cheveley Park), Somnus (6f), Kyllachy (6f) & Saoire (Irish 1,000 Guineas). A mixed record with his British raced 2yos with, for example, above average seasons in 2002 and 2004 mingled with below average records in 2003 and 2005. Gets winners at 5f to 8f from May onwards and notable that he has his best record (29% strike rate) with his limited number of 5f runs. Above average winners in recent seasons include Somnus (Redcar Trophy) in 2002, Windsor Knot (7f Group 3) & Listed winners Polly Perkins (5f) and Penkenna Princess (7f) in 2004 and Leo (8f Group 2) in 2005. 43 yearlings sold in 2005 for an average close to 120,000gns. His popularity at the 2005 sales more due to his overall reputation and record rather than his 2yos performance in that year. 8 winners from 22 runners in 2006 but at a high strike rate (27%) given that each runner made less than three starts on average. Better quality wins from Excellent Art (6f Group 2), Alzerra (5f Group 3) & Enticing (5f Group 3). His reputation has reached very high levels and the 30 yearlings sold made a remarkable average of 203,000 guineas (median 137,000).